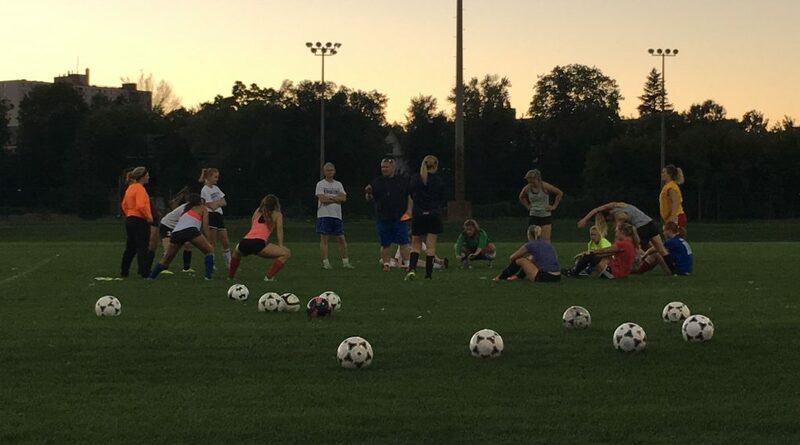 BELLEVILLE – The Loyalist women’s soccer team showed enthusiasm and confidence Tuesday night during their practice as they prepared for its match against the Fleming Knights Wednesday evening. The women began the season with tough competition from Cambrian College, losing 12-0. Loyalist’s head coach Steve Whitehead said he thinks the Cambrian Golden Shield are chasing a national title this season. He also explained how more experienced players are carrying the team. “They have several fourth year players; one of them is Tiffany Johnson who was the leading goal scorer last season and she will probably be this season,” Whitehead said. Whitehead said he believes the first game against the Golden Shield was important for his team. “We went away to Sudbury that first weekend and they got to know each other really well. It was good, even though the score wasn’t very good. It was a good team bonding experience,” he said. The last two games went better for the women, even though they lost 1-0 to the Durham Knights and tied the Centennial Colts nil-nil. Although these games were close in score, Whitehead said he believes the women needed to capitalize on the many opportunities that they had. He says he feels they should have won both games. At last night’s practice the team was doing offensive drills. Both Whitehead and assistant coach Jordan McConnell said they believe the team needs to work on getting goals and points. Third-year veteran Stephanie Young agrees with her coaches. “Tonight we practiced a lot of offence. We’ve worked out our defence over the last week and a bit, so now we’re really just working on offence and trying to get those goals and points,” explained Young. Teammate Kylie Holiday, also a third-year veteran, says she believes the team will be ready for Wednesday’s game, if they can keep up their high intensity and capitalize on goals. McConnell said she believes the girls are prepared and ready for the game against the Knights.